Surviving Biology Regents Exam: 2014 Regents Ready. Clean, clear, organized, simplified, not overwhelming, easy-to-use, easy-learn, easy-to-understand Regents Prep book unlike any others. Do more, track progress, build confidence, and be better prepared for your Regents exam. . Almost 6 Regents exams of questions. . Answers given to all questions. . Small number of questions per set for a quicker and less overwhelming practice for the Regents. . Clean, clear, simplified, and easy-to-understand explanations of answers. . Contains current Regents exams and grading formats. . Keep track of day-to-day progress, improvement and readiness for your Regents exam. . More studying benefits to build your confidence and preparedness for your Regents Exam. PREVIEW, READ AND PRINT OVER 25 PAGES OF THIS BOOK BEFORE BUYING. Visit our website (SURVIVINGCHEM dot COM) to get Instant Online digital preview. E3 Scholastic Publishing. Surviving Biology Books: Trusted by Teachers. Enjoyed by Students. 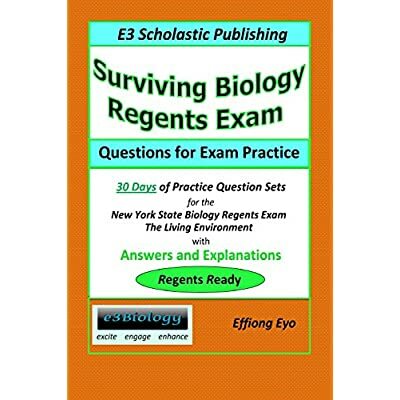 Preparing for Biology Regents exam has never easier, more exciting, more engaging, more understandable, and less overwhelming.